A burqa bandit in action on March 20, 2012. The criminal applications of this attire also were on display during an April 18 homicide at a barbershop in Upper Darby, a township bordering West Philadelphia. Police believe that a love triangle inspired Sharif Wynn to enter with a gun and demand money from the barber, Michael Turner. Wynn insists that he merely meant to scare the man, but officers say that he shot Turner intentionally at point-blank range. The police superintendent has revealed that the attacker was "dressed in Muslim female garb, was covered from head to toe. The only thing that was showing was his eyes." Authorities identified Wynn through interviews and his electronic trail. Though assembling a complete history of niqab-aided crimes is hindered by the unknown consistency of media reporting, the seven incidents outlined above appear to be the most that the Philadelphia area has suffered in any four-month period to date. However, the city earned its reputation as a burqa banditry hot spot long before this recent spike. The worst episode occurred on May 3, 2008, when three Muslim men — two dressed in female Islamic apparel and face veils — held up a Bank of America branch inside a supermarket in the Port Richmond section of Philadelphia. Police Sergeant Stephen Liczbinski gave chase, only to be shot to death by robber Howard Cain, whom officers killed shortly thereafter. Cain's accomplices were caught, convicted of murder, and sentenced to life. The Philadelphia area endured many additional cases between then and now. On November 16, 2009, a man in a face veil attempted to rob a Bank of America location in the suburb of Drexel Hill, but he left empty-handed after an employee played dumb; DNA from a niqab discarded near the scene later led to an arrest. 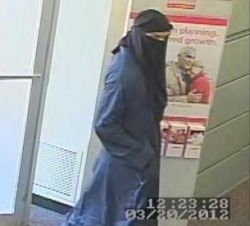 Other unsuccessful perpetrators have included an armed man in a "long black dress … and a hijab covering his head and face" at a Sovereign Bank branch in the city's Mount Airy neighborhood on February 1, 2011, and a niqab-wearing man at a branch of the same bank in Woodlynne, New Jersey, just across the river from Philadelphia, on June 13, 2011. Women have gotten into the act as well. Police arrested Lashawnda Jones in December 2010 following robberies of four TD Bank branches within a 40-mile radius of Philadelphia during the prior two months. Though Jones had sported a niqab in the earlier heists, she used only a headscarf (hijab) for the final one, in which she lured tellers to the vault, brandished firearms, and stole $103,000. Soon after showing her face, she was behind bars. A blog post by Middle East Forum president Daniel Pipes collects more examples from the area. Similar cases throughout the West — including many in Europe and a few others in North America — are listed too, but crimes of this nature occur with surprising frequency in the City of Brotherly Love. "What is it about Philadelphia, burqas, and robberies?" he wonders. The demographics of Philadelphia, whose Muslim population is among the largest in the U.S., make it particularly fertile ground. While only a very small percentage of Philadelphians wear niqabs, they are sufficiently numerous to be seen with regularity. Desensitizing the public to this radical attire opens many doors. "Whatever happened to the mask?" a local imam said in response to recent crimes, referring to ski masks often employed by robbers. Simply put, the increasing prevalence of face-cloaking Islamic garb is rendering traditional masks obsolete. 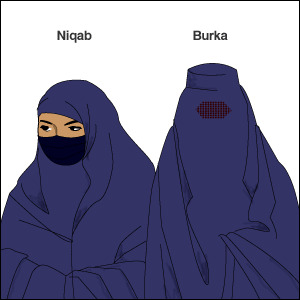 Both provide anonymity, but a niqab grants the wearer access that a mask does not. Whereas spotting a masked individual entering a bank or business strongly indicates a robbery, someone in a niqab doing so may represent just another patch in Philadelphia's multicultural quilt. Indecision about the wearer's motives — indeed, most women in niqabs do not have criminal intent — buys crucial time for a heist to unfold on the perpetrator's terms. 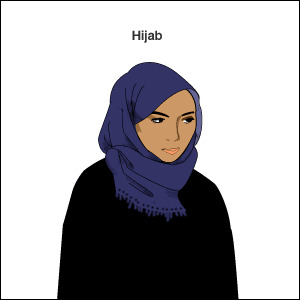 The relatively common sight of niqabs, as opposed to masks, also enables a robber to travel to the crime scene in the same face-blocking apparel, further lowering the chances of being identified. Moreover, they take advantage of political correctness, which cautions against scrutinizing people who don such clothes. A 2009 article in Philadelphia magazine captures how this atmosphere contributed to the robbery that left Sergeant Liczbinski dead: "To Western eyes, two of them became hijabi — Muslim women who cover themselves — by pulling on full-length black burqas. They became, in a sense, invisible. The bank sat inside a busy supermarket, where shoppers would surely notice the two monoliths moving among them; but just as surely, those shoppers would pass by with eyes cast down, or aside, or beyond. They may be drawn for a moment by the sheer otherness of the hijabi, but would dependably look away with a twinge of awkward guilt for having noticed." The journalist explains, "So complete were the robbers' identities — so perfect their invisibility — that the store's security cameras recorded the manager as he talked to an emergency dispatcher, and walked out between two of the disguised figures," utterly oblivious to them. Islamists promote this cultural paralysis. Case in point: the victimhood narrative pushed in the wake of the latest Philadelphia robberies. One imam declared them "a hate crime against Muslims," as they allegedly put Muslim women "in danger of being stereotyped, victimized, and ostracized." City Councilman Curtis Jones Jr. doubled down on the persecution theme: "In many ways I'm reminded of the shooting of Trayvon Martin, stereotyped because of a garment called a hoodie." Ibrahim Hooper of the Council on American-Islamic Relations (CAIR) chimed in as well. "Islamophobes love to see this sort of thing, because it gives them fuel to express their hatred," he claimed. "Now they can say, 'See, this is why Muslim women shouldn't dress the way they do.'" Therefore, banks must run the gauntlet of "Islamophobia" charges if they pursue a seemingly obvious remedy: forbidding attire that hides customers' faces from security cameras. Financial institutions nationwide have worked to deter more conventional robberies, reportedly with some success, by implementing dress codes that ban hats, hoods, and sunglasses, but Islamists have fought restrictions on headgear. When disputes arose several years ago over women being asked to remove headscarves or be served in alternate areas, CAIR characteristically demanded more sensitive policies and issued dubious calls for federal probes. Just as predictably, the banks and credit unions tended to cave and exempt hijabs. No doubt robbers note the deference toward Islam enforced by Islamists — a phenomenon exacerbated in cities like Philadelphia with copious Muslims and an aggressive CAIR chapter. Many Philadelphia Muslims cover their hair, so banks encounter substantial ambient pressure not to adopt rules that could affect any religiously motivated garments. This author recently visited branches of six major banks in Philadelphia and found only one — a PNC Bank location — with a sign requesting that customers take off hats, hoods, and sunglasses. (Coincidence or not, there is no record of PNC Bank being struck by burqa bandits.) As if to dissuade others from launching similar policies, Amara Chaudhry of CAIR-Philadelphia already has bemoaned, in the words of an MSNBC.com article, how a Muslim "was not allowed to enter the branch [of one bank] before first removing her hijab, making her feel as naked as removing her blouse and bra." CAIR officials have not specifically addressed niqabs in banks or complained of women being denied service because of them, but the year is still young. How to proceed? The ultimate solution would entail proscribing face-covering apparel everywhere in public, as France and Belgium have done. Yet American banks enjoy plenty of leeway to ban it on their premises right now, assuming that they ignore CAIR's specious threats and frequently bogus tales of Muslim victimhood. The First Amendment may protect niqabs on the streets, but banks are private entities and thus not bound by it. They also are not listed in Title II of the 1964 U.S. Civil Rights Act among "places of public accommodation" where religiously discriminating against clients is illegal — not that faith-neutral dress codes are "discriminatory" anyway, regardless of Islamists' pleas. In addition, though numerous states, including Pennsylvania, have civil rights laws that are more expansive than the federal version, the various requirements to accommodate religious practices of customers or employees are not absolute and typically must be balanced against the hardships imposed on others. One can debate whether banks should tolerate hijabs, which often obscure less of the face than hoodies or caps, but it is inconceivable that banks are somehow obligated to welcome niqabs that purposefully hide the face and burden others by undermining safety in a venue where security is paramount. If ski masks are not permitted, niqabs should not be either. Drawing the line with clear policies that prohibit all criminal-friendly garments on bank property would be a significant step in the appropriate direction — and almost certainly a legal one. Situated at the leading edge of this problem in the U.S., Philadelphians have a special responsibility to find effective solutions. Other American cities must stay alert as well, because the ingredients that make Philadelphia a prime target exist elsewhere; Detroit comes to mind. If Philadelphia manages to curtail the trend, its approach can be a template for comparable cities to follow. But if it fails, criminals in the country's niqab-heavy metropolitan areas may soon thank the trailblazing burqa bandits of Philadelphia for having provided a successful model of their own.